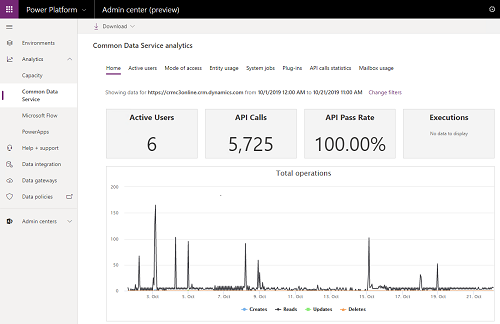 For introductory licensing information on the new capacity analytics model, see PowerApps plans. Data volume continues to grow exponentially, as businesses advance their digital transformation journey and bring data across their organization together. Modern business applications need to support new business scenarios, manage new data types, and help organizations with the increasing complexity of compliance mandates. To support the growing needs of today’s organizations, data storage solutions need to evolve continuously and provide the right solution to support expanding business needs. We have updated our capacity analytics reporting to provide important benefits to our customers. Here is a summary of changes in capacity analytics. 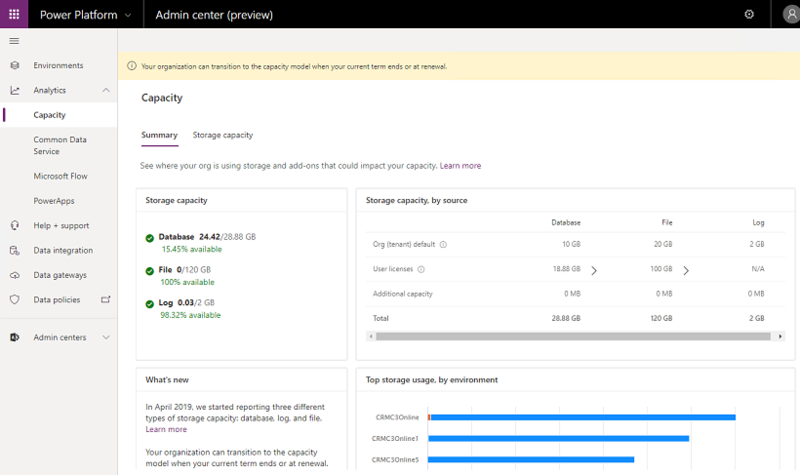 New Capacity page is available in the Power Platform Admin center. Admins can visualize the data stored in Database, Files, and Logs. Entitlement information is added to the report to help customers understand available capacity of the tenant level. Existing customers get entitlements for new types of capacity (File and Log) but are not impacted by the licensing change until renewal. 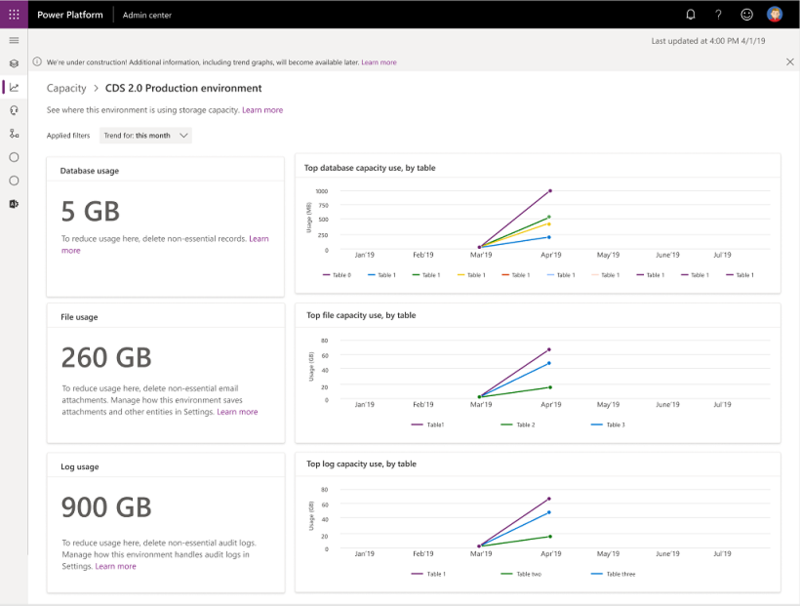 The new capacity analytics reporting provides a single place to view your capacity data. In the previous storage model, you viewed information in multiple places. We're optimizing data management for database storage, attachments, and audit Logs. There are now three types of storage: Database, File, and Log. 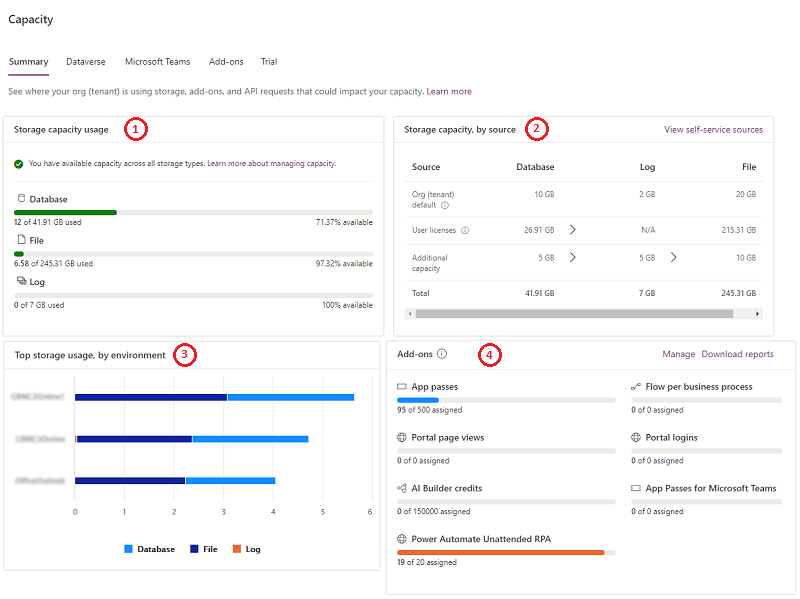 This page provides a tenant-level view of where your organization is using storage capacity. To view the Capacity page, select Analytics > Capacity > Overall tab in the left-side menu. This page provides similar information as the Overall tab but with an environment-level view of where your organization is using capacity. Select an environment to see more detailed information on actual consumption. Admins can select environments showing 0GB to go to the Environment Analytics page and see the actual consumption. This page provides an environment-level detailed view of where your organization is using capacity as well as the three capacity types consumption. Select Applied filters at the the top of the page to filter data for different time spans. I am an existing customer, will I be immediately impacted by this change? No, there is no immediate change for existing customers as your current term will be honored for the duration of your agreement. I'm an existing customer with an EA agreement. Should I go buy Log and File capacity? If you have an existing agreement, you are not impacted with the current change. We have added Log and File capacity to your current entitlement which reduces your Database capacity. Until renewal, you can continue with the current plan. I'm an existing customer and my renewal is coming up. Will I be impacted? Customers who renew existing subscriptions can choose to continue to transact using the existing offers for a certain period of time. Please contact your Microsoft partner or Microsoft sales team for details. I'm an existing customer. Should I expect my Log and File usage to change? Log and Files data usage is not expected to be exactly the same size as when the same data is stored using Database due to different storage and indexing technologies. The current set of out-of-box (OOB) entities stored in File and Log might change in the future. Will the Storage tab in Common Data Service continue to work? The Storage tab will be deprecated as we move to the new updated Capacity Analytics. I have a PowerApps environment with Database, will this environment count against capacity? Yes. All Common Data Service environments are counted. How can I reduce consumed storage space? See the following: Free storage space. My Database capacity just dropped suddenly in the new report, why? It is expected that for most customers the Database storage will drop, as we are now counting the data stored in Files, attachments under File Capacity, and data storage in Audit, Plugin trace logs under Log capacity. Your data is not deleted. My Log/File Capacity is showing as RED, what should I do? If you have an existing agreement, you are not impacted with the current change. We have added Log and File capacity to your current entitlement. Until renewal, you can continue with the current plan. When will trend information be added to the new report? We will be adding Trend data shortly after the release.